I spent the summer of 2000 in Northern Ireland, working with a ministry there called Project: Evangelism. John Moxen will likely never know how formative my time with him there was. He was a temporary mentor, and I only wish that I had honored him with more of my time while I was there, or simply had been able to spend more time there in general. My three trips to Northern Ireland and Project: Evangelism are a part or the makeup of my spiritual life and are - in many ways - when I grew from a boy into a man. It was during this trip when I had perhaps my most emotional and spiritually draining prayer experience. I try to keep my conversations with God fairly simple. I find that Christ's example in the Lord's Prayer was pretty simple. It consists of honoring God, of asking for our most basic needs, and for God to shape us into His will. As such, I ask for little, try to give thanks a lot, and am more concerned with the simpler needs than extravagant, supernatural requests. Please don't think that I'm saying we shouldn't pray for such things; it's just not in the norm of my prayers. But this story is a story about one of those times when I truly believe the supernatural interceded. A trio of students who were there the summer I was on staff came rushing into the house in a panic. What was the cause? One of them had been attacked by a demon. Now... I don't know what really happened that night. I didn't see a demon. I'm not at all an expert on these things. Here's what I know: these students were scared. They were crying, they were freaking out, and something was desperately wrong. This was early evening, somewhere around 8pm. The boy who had been "attacked" went straight to the students' bedroom. I went in to talk with him and pray with him. I believe he told a genuine story. I believe that something happened that night. And I know this - there was a spiritual battle going on in the room, surrounding us. We prayed and prayed for what seemed like hours. In truth, it was probably somewhere between five and ten minutes. The passion was there, the urgency was there. I remember praying these words: "God, take your protection from me and offer him a double dose of your spirit. Protect him through the night." Moments later our prayers ended. Then I was driven straight to my bedroom. I was overcome with exhaustion. Every part of me was saying to go to sleep, to rest, and to simply let tomorrow come. My spirit felt naked and open. I don't know how all this works. I can't say that I have anything much to say about experiences with angels or demons or any knowledge of how I've been spiritually protected in the past. But I know that prayer is real, and that it is heard. Donald Miller did a great job at setting the tone for the following presenters, talking specifically about narrative and how stories effect us; specifically, how our personal story effect us. 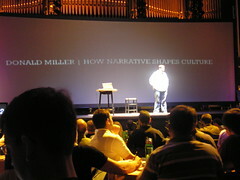 Miller began by telling the story behind on of his yearly rituals: every year he spends time to sit down and literally decide what he’s going to spend the next year doing. What is your next year going to be about? This past year he was struggling, however, as he couldn’t decide what it was he wanted to do for the first time. While he was still trying to figure it out, he received a call from a friend he’s known for years. He had once sent her a letter that described the things he wanted to accomplish in life. They talked about that letter and he discovered why he no longer knew what he wanted to do: he had accomplished all the he had once dreamed of. He needed a new story to take part in. · The story becomes as important as the dream. If the protagonist dies, their dreams die. What is lost if the dream dies? · If your ambition is evil, you are the villain. · If your ambition is apathetic, you are a background character. The problem he describes for the church today is that our story has been hijacked by a lesser story; the story of secular culture. For all the time we spend on “sacred” entertainment, we spend hours more on “secular” entertainment. We need to be a part of a better story. Miller describes a friend whose daughter was dating a… less that appropriate suitor. Her life was going down a path the father did not approve of, but he didn’t know how to help her. When the family stumbled into an opportunity to help build and fund an orphanage in another country, the family rallied around the idea. The suddenly found a better story. Saving lives was such a better story to be in than rebelling against her father. The family found themselves in a better story, and better for it. I think the psychological implications of story and narrative can run deep. I find myself agreeing greatly with Miller – I wish he had taken the ideas further. I don’t think that the church has been simply hijacked by a lesser story; I think most churches don’t have a story. In Kevin Kelly’s presentation he made the “controversial” statement that we have to consider the possibility that Armageddon won’t happen in our lifetime. That there are other options for what will happen in the year 2100, 2200, or even 3100. So many churches have grown lazy because there is no greater story; they don’t know about social injustices like slave trading or environmental issues that will affect their children’s children. And so, the biggest story their church is caught up in is the color of the carpet. So many churches have dissention because their pastor has not given them a better story to be a part of. Every story needs an antagonist; if the church isn’t aware of opportunities to change culture for the better, if they aren’t aware of the movements of Satan, they can easily lose sight of who their antagonist is. In a culture where the greatest antagonist is “the man,” then if the church has no other antagonist the first, and easiest, person to see as the villain is the pastor. If the pastor hasn’t given his church a better story to be a part of, his people will turn on him or leave. Big churches can get by on the story of being part of something big. Church plants can get by on the story of being part of something new. Aging churches can get by on the story of being a resting place before they die. Or, we can have a better story. What is your church’s story? 1) The audience is engaged in not only the story being told, but also the myriad of directions the story can go 2) The storyteller knows the ending and, as such, can craft details and steps to better take the audience to the themes and morals of the story.